With a semi-final spot still not assured, Jaipur Pink Panthers took on Bengal Warriors in a spectacular clash where the Warriors emerged victorious by a score of 39-38. Rajesh Narwal scored 10 points in a losing cause, while Mahendra Rajput amassed 11 points for Bengal Warriors. However, the star of the show was captain Sunil Jaipal, who won 12 points for his team in this attacking match. Jaipur Pink Panthers and Bengal Warriors faced off in the second match of the opening day of the Pune leg in Pro Kabaddi and it was the Panthers who took an early 2-0 lead through Sonu Narwal’s and Rajesh Narwal’s raids. Sunil Jaipal levelled the score at 3 each in the 4th minute by scoring 2 points from his raid. 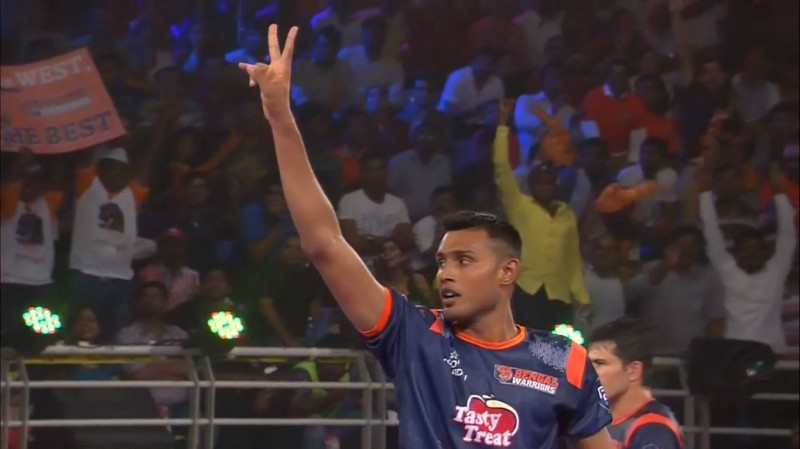 However, Sonu restored Jaipur’s advantage by winning 2 points in the very next raid. After Mahendra Rajput made it 6-6 in the 8th minute and it was all Bengal from that instant as they completed an all out in spectacular fashion when Sunil Jaipal scored 5 points in the next minute. With this raid from the Bengal Warriors captain, the team from Kolkata led the Panthers 12-6. By the 15th minute, Bengal Warriors had extended their lead to 8 when Jasvir Singh was caught in his raid. Sunil Jaipal inflicted another all out on the Panthers in the 16th minute as the Warriors increased their lead to 12 points (22-10). The Panthers won a couple of points in the final minutes of the half as the Warriors led 24-14 at the halfway mark. The defending champions managed to win just 1 tackle point in the half. Both the teams exchanged points for the first three minutes of the half before Rajesh Narwal reduced Bengal Warriors to just 3 players. However, Jasvir Singh was caught in a super tackle while Mahendra Rajput conjured up a super raid to increase Warriors’ lead to 14 points as the scoreline read 17-31 in favour of the team from Kolkata after 25 minutes. In the 27th minute, Rajesh Narwal started a comeback for Jaipur by winning 3 points from his raid. By the 33rd minute, the Panthers had enforced an all out on Bengal Warriors to reduce the deficit to just 7 points with 7 minutes left in the match. Mahendra Rajput made it 39-28 in the 35th minute and at that stage, it looked like Bengal Warriors would end their campaign with a win. However, Kuldeep Singh had other ideas as he scored 5 consecutive points for his side in the final 5 minutes as the Panthers made it a 3 point game with the final raid to go. Jasvir Singh stepped up and returned after tagging 1 defender from the Warriors as the referee brought the match to a close awarding the Panthers a solitary point. But, a frantic few minutes ensued after Jasvir called for a referral as the audience stood rooted to their seats with bated breath. The review yielded a technical point for Jaipur, but it was not enough for the Panthers to tie the match as Bengal Warriors edged it 39-38 to end their campaign with a win. Patna Pirates would be thankful to Bengal Warriors as with this result, the Pirates’ semi-final hopes are in their hands. If the Pirates win both their matches, they will make the semis, whereas Jaipur will have to avoid defeat against Patna on the final day of the group stage.